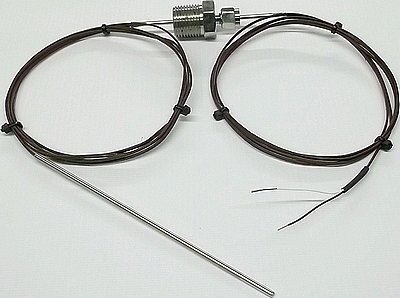 Professional quality thermocouple specially designed for the Autoclave industry. 3mm Dia X 150mm 316 Stainless tube housing a welded junction along a 3mtr PTFE lead. Also half way we have a 3mm X 100mm stainless tube crimped at both ends and a 1/2" BSPT compression fitting which is used to seal the thermocouple inside the Autoclave.